If you’re dead serious about staring an exciting career in law enforcement and you’d like to learn the “insider” secrets to help you absolutely ace your police oral board interview, then this may be the most important message you’ll ever read. As a certified police oral board rater with over 16 years of “hands-on” police interview experience, I regularly spend 8 to 10 hours a day sitting across the table from new police applicants just like you. It's my job to rate, grade and assess new police applicants through the police oral exam to determine their suitability to be hired as police officers. I do this by asking some pretty tough questions… questions that give me insight into your honesty, integrity, and job knowledge…as well as your judgment and reasoning abilities… all of which are scored through several complex scenario type questions. I’ll be honest…passing the police oral board interview definitely isn’t easy. The police interview questions that will be asked during the police interview will be unlike anything you’ve ever been asked before. In fact, the police oral interview is likely to be one of the most nerve-racking things you’ll ever go through. You see, research shows the biggest hurdle to you landing a job in law enforcement is the dreaded police oral board interview. In fact, police oral boards eliminate more prospective police applicants than all other parts of the police testing process…combined! I’ve recently put together the most comprehensive resource available to help you land a job in law enforcement. It’s called Ace Your Police Oral Board Interview and it’s really a $500 police oral board preparation seminar all crammed into an “A to Z” success guide that guarantees you a top spot on the police hiring list. Because let’s face it. If you’re not 100% ready to absolutely “smoke” your police oral interview…or if you’re thinking that just passing is enough to get you hired…you are COMPLETELY misinformed. And when someone scores higher than you on the police oral board interview, they’ll appear to be the better choice. So I can’t stress to you enough about how much is riding on you at this point. This is “do or die” time. Score high on your oral board interview…and you’re all but hired. But fail…or pass with just a meager score…and you’re off to break the bad news to your friends and family members and everything you’ve done up to this point is wasted. With an average of 107 people applying for every open police position, the competition is fierce! And that’s why having an extra “edge” will ensure you a top spot on the hiring list. Ace Your Police Oral Board Interview is information that you simply won’t find anywhere else because there’s no one else out there who’s actively grading and rating new police officer applicants on a daily basis like I am. And there’s also no one else who’s actively collecting and researching the oral board questions being asked by police departments across the country. You see, this is a guide by a real life police oral board rater—not some research group or retired police officer who isn’t up to date on the latest and ever-changing trends. Ace Your Police Oral Board Interview is, by far, the most up to date, most relevant police interview success guide in existence. And I’m constantly updating it to stay on top of the latest trends, so you’re always guaranteed to have the most applicable information available. Really, once you take the unknown out of the picture…once you know what questions will be asked…and once you know exactly how to answer those questions…you’re virtually guaranteed a top spot on the eligibility list. It’s really this simple: If you want to turn you’re your dream of becoming a police officer into a reality, you’ll find Ace Your Police Oral Board Interview to be pure gold. Ace Your Police Oral Board Interview is a downloadable PDF guide that’s loaded with tips, tricks and inside information for passing the police oral board interview. And best of all, it’s jam-packed with the most commonly asked police interview questions (and the best answers) that virtually guarantee you a top spot on the hiring list. Discover the most commonly asked police interview questions: Don’t be caught off guard! Know what questions will be asked during your police oral exam and your battle is virtually won. Ace Your Police Oral Board Interview is “jam packed” with all the questions you’re most likely going to be asked, including the tough scenario questions that test your job knowledge, ability, judgment and reasoning abilities. The sample police interview questions in this guide come from over 16 years of “hands on” in the trenches experience as well as interviews and networking with police oral boar raters across the country. Get the VERY best answers to even the toughest police oral board questions: Knowing what’s going to be asked during the police interview is one thing…knowing the best answers to those oral board questions is another. Ace Your Police Oral Board Interview is guaranteed to help you come out on top of the hiring list by handing you the answers that are guaranteed to make your oral board panel take notice. Know why each question is being asked and what the police oral board panel is trying to find out by asking those questions: When you know what the oral board panel is looking for, you’ll know what to give them…giving you a decided edge over your competition. Learn how to build your answers to those sneaky follow-up questions that catch even the most prepared applicants totally off-guard: Often the police oral board panel will ask interview questions followed by a series of other questions to see your reaction. Once you learn what they’re up to, you’ll be able to handle this situation with ease. Learn the most commonly missed question being asked on police oral boards today: This is usually asked up front and it can set the stage for the rest of your oral board interview. Avoid getting the ___________ /____________question wrong! Failing to answer this specific police interview question correctly during your oral exam will result in immediate failure because it shows that you are truly not cut out for police work. Learn the “insider” secrets to making a great first impression with a police oral board panel: Police look at people differently than most interviewers so it’s important to bring your game face to the interview. I’ll show you how! Avoid making these common body language mistakes: the police are “experts” in reading body language. That being said, you’ll need to know what to do and what not to do during your police interview so that you appear confident and they feel comfortable about offering you a job. Impress your police oral board panel by answering the _____________ question correctly: For those not working in law enforcement, this interview question for police applicants is usually tough—but not for you! While most of your competition will get this one wrong, you’ll be sure to get those extra points you need to propel you to the top of the list. Learn what to wear and what not to wear to your police interview: Understand that your appearance is not only going to be part of your first impression on the police oral board, it’s also going to be rated. Don’t let something you can control be your demise! **Just Added** a comprehensive list of bonus questions recently submitted by readers of this guide to make sure all of your bases are covered. Knowing these questions on top of every other question in this guide guarantees to give you an incredible advantage over your competition! Plus many other police interview tips, tricks, and secrets to oral board success! "I successfully passed my oral board"
"I'm now on the eligibility list"
I wish I could say that I was hired as a police officer the first time I tried…but I wasn’t. In fact, it took me four times until I finally got the job. And each time I didn’t make it, it was the dreaded police interview that did me in. For as long as I can remember, I wanted to be a police officer. So when I was finally old enough, I began to test with police departments in my area. My first two written tests and physical agility tests weren’t a problem at all. So naturally, me and my friends and family all thought the oral board would go just as smoothly. I can remember each failure like they were yesterday. Everyone was so excited for me…my parents and friends wishing me luck…telling me how proud they were as I headed for the interview. A few hours later, I retuned with the bad news. I was embarrassed and totally devastated. My third test went a little better. I passed the oral interview with a 76%...just above the 75% cutoff. And as poor as my score was, I was relieved. But the score just didn’t cut it. I was too far down on the eligibility list to get selected. That’s when I began doing “ride-alongs,” talking to police officers, and reading every book I could find about what police interview questions would be asked, (long before the Internet days). All my “research” paid off. Finally, a respectable 87% on the oral board interview helped me get hired and I started the police academy approximately three months later. When it comes down to it, there are really only two types of police officer applicants…those that get the job and those that don’t. And judging by the sheer numbers of people testing against you, you already know the majority of the applicants aren’t going to get the job. Imagine walking into your police interview with a certain knowledge that you’ll soon be leaving that same oral board with your head up high because you just absolutely nailed those tough police interview questions they asked. And because you just smoked your police oral board, you’re now light years ahead of your competition and just a few small steps away from getting your badge and landing the job of your dreams! As a certified oral board rater with over 16 years of law enforcement experience (and counting), I see good…even great candidates get disqualified and washed out of the testing process waaayy too often. Then there’s those who are lucky enough to just barely “squeak” by with very low passing scores…these are the people that end up “dying” on the eligibility list time and time again because their scores just don’t rate high enough when compared to all the competition. And finally, there’s the very small few…that elite 1%...that absolutely ace their oral board interview…those that end up on top of the list…those that become police officers. So why do a small few actually “ace” the oral board while so many others fail miserably or just merely “squeak” by? Yes, you can prepare for your oral board interview. And you can do so with a very high degree of success. You see, the police oral board is much different than any other interview you’ve ever been through. And that’s because all police departments across the country are looking for the same type of person. They are looking for someone who’s honest…someone that can demonstrate that they have the integrity and good, sound judgment and reasoning skills necessary to serve as a police officer. Because police departments across the country are looking for the same type of person to become a police officer, they ask the same type of questions on their police oral board interviews. And despite this fact, most police applicants still go into the oral interview “blind.” They don’t know what to expect…they don’t know what’s going to be asked…and they aren’t prepared to answer those tough questions. The reality of the police oral board interview is this: the most qualified applicants don’t always get the job…the most prepared interviewers do! So if you want to be absolutely sure that you’re 100% prepared for your police oral board interview...then I urge you to get your hands on the ultimate police interview success guide. Because you’ll see that once you know the questions (and answers) to the tough police interview questions that you’re going to be asked, there’s simply no possible way you can fail. 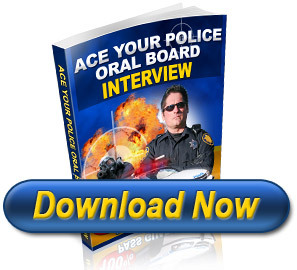 Ace Your Police Oral Board Interview is a complete A to Z success guide that teaches you everything you’ll need to know to successfully pass your police oral board interview…and it can be in your hands by instant download in less than two minutes from right now. It will not only let you take that crucial “giant leap forward” in the testing process – it’ll propel you past the competition and give you exactly what you’ll need to outperform everyone testing against you. But I also know Ace Your Police Oral Board Interview is everything you’re going to need to put you on track to working in the exciting field of law enforcement. But I don’t want you to take my word for it…and I don’t even want you to decide right now whether or not this guide is for you. Download the guide right now (it’ll be in your hands in less than two minutes), dig through the material (even print it out if you want) and really put it to the test. Then…and only then…decide if this guide is right for you. If it is…great! You’ll have the crucial information you need to be well on your way to an exciting career in law enforcement. But…if this guide isn’t everything I’ve described…if you don’t absolutely “ACE” your police interview…or if you’re just not satisfied with the information for any reason at all, just let me know anytime within the next 60 days, and I’ll issue you a lightning - fast refund of every penny of your investment into this guide—no hard feelings and no questions asked! That’s exactly how confident I am that everything you’ll need to ace your police interview is covered right here in Ace Your Police Oral Board Interview. And really, if Ace Your Police Oral Board Interview isn’t everything I’ve described…if it doesn’t help you pass your oral board interview with flying colors as I’ve promised…then I don’t deserve your money…and quite frankly, I’d be embarrassed to keep it. that’s completely at my risk—not yours! Wishing you a rewarding & exciting new career in law enforcement! P.S. You’ve already come this far…and for that you should be extremely proud. But don’t let it all slip away now. If you’re dead serious about getting a job in law enforcement, there’s simply no better investment into securing your new career than this guide. It has all the questions you’re most likely to be asked…and it tells you exactly how to answer each question. P.P.S. Remember, I’m taking all the risk with your order today. If you’re not 100% completely satisfied thrilledwith Ace Your Police Oral Board Interview, all you need to do is let me know, and I’ll happily send you a prompt refund of every penny of the purchase price—no questions asked!